eBatiz+Associates established guidelines for a competitive analysis of the restaurant and entertainment venues in the Westchester, NY geo. 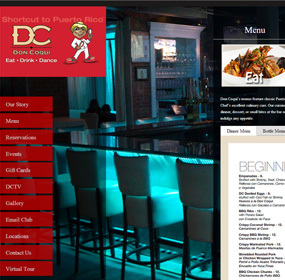 On-Premises: We coordinated all Corporate ID usage: logos, menus [printed and digital], animated characters [in all visuals, including CATERINGPLUS‘ delivery vehicles], and promoted the slogan: Shortcut to Puerto Rico. Results: The multicultural campaign has overpowered the competition. 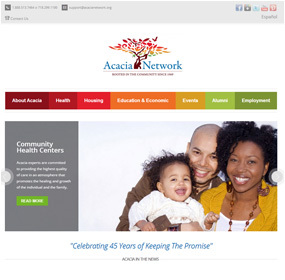 eBatiz+Associates was hired by Acacia Network – the nation’s 2nd largest healthcare organization concentrating on underserved communities – to analyze their internal and internet capabilities, and to provide a “90-Day Pilot Program” aimed at implementing new and innovative solutions. In that short-window we generated a competitive analysis of all healthcare centers in in the operative geos. Off-Clinics: We developed an integrated Q&A strategy [ACACIANSWERS:], set-up all online marketing [SEO, PPC, Mobile]. We also produced an online bilingual [English/Spanish] eVideos Gallery with interactive overlays and Landing Pages for an umbrella campaign, individual health centers and diseases/conditions. In-Clinics: eBatiz+Associates has initiated a Plan of Action that will take Acacia Network to the next level. Results: In less than 90-Days, Acacia Network went from 12th ranking to #2 behind Montefiore Medical Center, even though they are being outspent by that giant! eBatiz+Associates took on this real estate agency during a wobbly economy and wary home buyer sentiments. 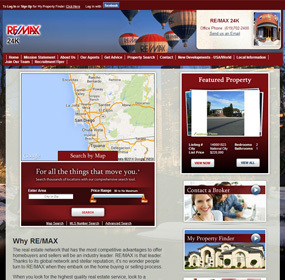 After analyzing internal and internet capabilities we implemented a turn-key “90-Day Pilot Program” aimed at raising RE/MAX24K’s brand in the San Diego geo. Off-Agency: We developed strategically positioned eVideos with outstanding testimonials from highly satisfied home buyers, and set-up all online marketing [SEO, PPC, Mobile]. The online bilingual [English/Spanish] eVideos with interactive overlays connected prospective buyers to highly trained agents. In-Agency: We also implemented and trained Agents to answers customers instantly and close sales. Results: RE/MAX24K has experienced the influx of qualified leads and better than expected closings! 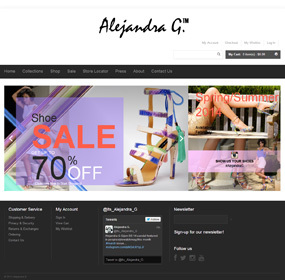 eBatiz + Associates implemented a completely adaptive online web layout for Fashion Shoe Designer Alejandra G. Along with ensuring a smooth shopping experience for customers across a wide variety of screen sizes and devices, and an aggressive online marketing approach was implemented that included SEO, PPC, and the production of multilingual YouTube Ads. Results: Just in time for the release of a new shoe line, sales have been increasing steadily and are breaking all previously established online sales records for the designer. eBatiz + Associates assisted the construction group to update their previous online presence and implement a responsive website design, with a focus on ease of access for mobile customers. A two-pronged marketing strategy was implemented, which consisted of tailored online advertising in the form of SEO and PPC, along with the production of a complete YouTube ad campaign. Results: The new facelift to the ACS-Group has been extremely well received, with customers, both residential and commercial, better able to interact with the organization, and learn about the wide variety of products and services. 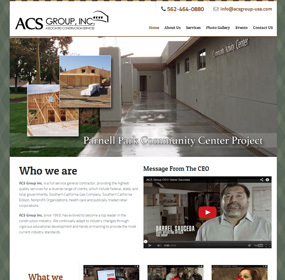 The marketing strategies implemented put the ACS-Group in a prime position, and they are ready to take off! eBatiz +Associates worked with RAIN Inc., an established non-profit organization, in order to implement a fresh online experience in the form of a new website, refocused online marketing, and the production of YouTube ads highlighting the organization’s initiatives and dedication to the care of seniors. 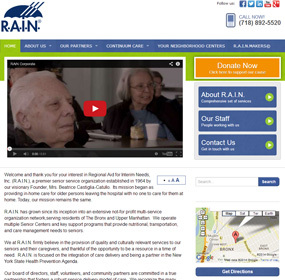 Results: The revitalized web and marketing presence for RAIN Inc. has drawn considerable attention from the community, and has helped better represent the various locations around NYC which the non-profit services. Ebatiz © 2015 | All rights reserved.